You're at work. Things go bad. What would you do? I start a new job on January 1st. I'll be across the street from one of the largest hospitals in the region. I cant decide if the pros outweigh the cons. i'm normally no more than 25 miles from home, sometimes more like 10 or 15, i'll just take the back roads home, not many people use them.i live in a rural area not much traffic. 28 Days and 28 Weeks Later...nicely gory. Stay at work. We have redundancy. On grid + solar panels with massive battery bank + diesel generators with a very large fuel tank. Generators flip on if the power goes out for more than 10 seconds. Very small town here. I work at the one grocery store. I live 2 miles away. Straight shot to and from work. If power goes out at the house, I have a woodstove. My zazzle: http://www.zazzle.com/fripperyfarm" onclick="window.open(this.href);return false; New line of Frippery Farm merchandise! My blog: http://droptheshoe.blogspot.com/" onclick="window.open(this.href);return false; My misadventures in farming and livestock raising! This is a downside (among many) of working as a paramedic...business picks up when things go bad. policy is to shelter at station during severe weather events (cyclones) then continue to work until relieved. You will have paramedics doing 24 hour to 72 hour shifts depending on the location of the station and severity of the cyclone. I work night shift in the Emergency Department of the local trauma center. We are in FL, so our building codes do not take earthquakes into account. Any other disaster that causes the effects you are describing, but leaves the building standing and I will be stuck at work for a while. Fortunately I am only about 5 miles from home, so I will be able to walk when I get relieved. I have multiple routes I take home from work regularly and grew up in the area so know the back roads and trails pretty well. I should able to navigate home. I work night shift so my wife will be home with our 5 year old son. I have radios that could reach from work to home, but do not carry one with me. If the emergency is long duration I would probably start. I can take a charger and batteries and rotate them to charge at work. I really need to get together a work stay over kit for my locker. Some toiletries, shower slides, spare clothes, etc. Just in case I have to sleep there. It has happened before with hurricanes, but those are forecast well ahead of time so I bring a bag with all that stuff. Haha, if my car is out of commission and things are really bad, I'm basically screwed. My commute is 96 miles each way. Last edited by Jhangles on Mon Feb 11, 2019 11:22 am, edited 1 time in total. It would take me between 30 and 32 hours to walk home, and 8-9 hours to bike it if I could get a bike from someone. If it's a TEOTWAWKI situation I'll probably try to [REDACTED] a car and get home. Please familiarize yourself with the ZS Rules, especially Rule #1 regarding the discussion of illegal activities. This is a hard and fast rule, not open for discussion or debate, continued violation of which can result in bad things like timeouts, forced vacations from the forums, official warnings, and, ultimately, banning from the website. Good question. I had toyed with this idea before, but I don't think I have fleshed it out as much as I should upon consideration. There are a lot of variables to consider. If a tornado or earthquake (tornado more likely in my area) really messed stuff up while I was at work, I would be fine. I work at an old, squat former hospital that has been converted into an office building. There is an entire basement level that would be safe while an event like a tornado occurred. My EDC has a bunch of stuff in it and I've kind of already started to hoard small amounts of non-perishable food, some toiletries, first aid, batteries, flashlight, etc at my work because a benefit of high anxiety is over-preparedness. I actually store less than I would like because people start looking at me like I'm nutty. Surprisingly and maybe sadly, this is not my business partner/office mate, but my husband. Probably my clients would as well, but they don't know. My husband would be okay as he works in a pretty state of the art, built to withstand a lot facility that makes proprietary tech. I would worry about the kids. My daughters have three different daycare sites (my parents, my in-laws, and part time daycare). I know where they are any given day, but my in-laws house is pretty rickety and neither house has a basement in case of tornadic activity. Which I worry about all the time, but no one will let me get out a shovel and start digging a basement and my parents didn't put one in (much to my annoyance) when they were constructing their outbuilding. I feel better about daycare, as the girls are in the basement level and the daycare watches the children of many essential workers and so has really good emergency protocols as they are open during less than desirable conditions, including a recent ice storm. My son is at a squat school that has been around forever and has a basement and decent emergency procedures. My husband works 5 minutes away from out home. He would just walk home. My hope is that his car wouldn't be totalled so he could pick up kids. My parents, in-laws, daycare, and the schools all.have landlines that usually stay active so he could contact them from the landlines at work if cell towers were down. Unless a tornado specifically sucked it up and took it to Oz or a fissure to hell opened up underneath it, my house would likely only have minor damage from a tornado or earthquake, given how far away the nearest fault line is to us. If our house was jacked up, we would go to my parents or a friend's house. One of the issues in this scenario would be that I work 40 minutes away in a rural area. If my car is jacked up, that poses an issue getting home. I do know people who could give me a lift or if it was a small disaster am hoping that between our cars, my parents, friends, etc some of the vehicles would be working. Additionally, if cell towers are down, that limits communication as we no longer have a land line at the office. My husband has landlines at work, but none that reach him. It is a huge frustration for me and in my mind a safety issue that they do not have direct lines to the floor staff that anyone can pick up. So his cell (which he is not allowed to check at work unless on break or receive a write up) is the only way to reach him during the day. He has kept me from calling HR and complaining, although I think for anyone with a family it is a reasonable complaint that you should be able to be reached quickly in case of emergency. So, my husband and I would have a hard time reaching each other without cell phones. I have thought of getting a landline again for issues such as this. We could also potentially coordinate through my parents initially as we could both reach them through other's landlines. This being said, emergency dispatch for the county is in the same building as my office. Hopefully, if anybody still had communication lines open, it would be them. I would want to use a phone immediately to check on my children if possible. If they were busy, a school I work with closely is only a few blocks away and I know they would let me in to make a call. I also have some friends who live within walking distance of my office who would let me stay with them if I couldn't hunker down in my office. My office is comfortable enough I probably could do so for a while. So, after looking at all this, the main issue would be reaching each other after something occurs if cell towers were down. And worrying about my kids, but not much is to be done about that, unfortunately as I cant dig basements in people's houses by myself and can't afford to financially put them in daycare full-time. And, since I can be honest on here without getting into an argument because my husband is not a member, a huge side issue is that my husband would have to potentially be independently in charge right after a disaster if I was at work in checking the house and taking care of the kids until I could get back to them. While intelligent, he tends to have a one track mind and does not possess a lot of mental flexibility. That means in stressful or quickly changing circumstances his mind often just goes blank. He also gets eye-rolly about my "paranoia" and counts money spent on preps as a hobby he only tolerates, which results in him not using, storing, or remembering the preps I have in the house or in the cars. Anyway, you get the drift. It's both a safety and relationship issue. Regardless, after waaaaay over-processing this over the last hour, I really need to stop putting off making step-by-step hard copy laminated emergency plans to keep in our cars, my son's backpack, and in a few places in our house. Hoping if I stress that they will be helpful for everyone and try to develop them together, my husband will actually look over them. We're pretty well prepared for this scenario, I'm 100% work from home, except maybe a week or two a year out of town at one of the company's regional facilities. Wife is a homemaker, no kids to worry about. Each of our trucks are 4x4 and has a vhf radio, the most frequent places we travel to locally are within simplex range of our base radio at home. My truck has more of the bugout/GHB gear while hers is more "shelter-in-truck and wait for rescue" oriented. We live off the grid; ICF home with hurricane/tornado straps on the trusses, solar power, propane standby generator, septic, wells, and woodstove heat. So roughly 90% of the time we're both in our very self-sufficient home, or just a few miles away from it, and have the means to communicate to find/rescue each other if necessary. My primary concern would be if I was out of town when a tornado/earthquake struck at home, particularly in the winter months. The wife is knowledgeable on the workings of our home but things can get tricky in the winter/cold, generator can be rough starting in single digit or lower temps and keeping the solar panels (on the roof) clear of snow for example. She's fine handling all the routine things to keep the home working, but less so when things go wrong or on some of my backup/contingency plans. If it struck the location where I was out of town working at the time it might not be all that bad, mine is a Fortune 50 company and has pretty extensive corporate emergency/disaster plans - part of our business is disaster recovery for other businesses. Shelter/housing shouldn't be an issue even if the hotel wasn't an option (nearby friends, or just stay at the company facility). On the day I arrive I always hit the grocery store to stock up on food/fluids to keep in the hotel room for the length of time I'll be there. My company's name carries some clout too, I used it once when trapped a couple hundred miles from home when my flight got diverted by weather to get a hotel and a one-way rental car the next day when others were being told neither were available. Found that when hotels and car rental companies say "No cars/rooms available", they'll often be able find one when your company is one of their biggest customers (so carrying your corporate ID even on vacation travel might be a good idea). And while I'm never happy with the size/weight/item constraints on my out-of-town GHB I'd be better off than most travelers I think, including $500 in cash and two 1 oz gold eagles (to grease the wheels if needed). Obviously it depends on the disaster. My main office is 1.7 miles from my house, so I might have to walk home. If I'm in one of the 4 satellite offices doing work I could be up to 15 miles away. I always have my GHB with me plus extra gear in the car depending on weather. The furthest office is about 5 blocks away from the county sheriff's office. I know most of the sheriff's department, deputies, sheriff and dispatchers, so I could likely get a ride from LEO at some point as resources are being moved around. I've been looking at the whole portable HAM radio thing and haven't purchased yet. Thinking about this now, I might make a point to keep a small radio with my GHB and have a radio preprogrammed back at home. All is forgiven. It's part of the learning process for preppers; understanding the steps we need to take ahead of time so we don't put ourselves in a position where we even have to consider putting our welfare over that of others. Trust me, you're not, ahem the only one who went afoul of the ZS rules when they were new to the forums. Do you even own a bike? If so, maybe put it in your vehicle if you get any advance warning that something might go down. Are you in any kind of biking condition? Riding a century cold is not easy if you haven't put in some training miles. Might be better to plan on taking two days to complete the trip. To answer OP's question, I have a GHB in every vehicle I have, plus the basics of a whole other one stored at work. I live in a rural area and in any case don't have any place to bug out to. So a central tenant of my preps is simply to get home and then shelter in place. I live about 15 miles from work as the crow flies, but I'm figuring on close to double that if I have to cover the distance on foot. Jhangles' revised post has me thinking about putting my hybrid bike in the car if things start looking dicey. When I looked at hybrid bikes a few years ago, everything was into 4 digits. Then there was the matter of the Cat. Sounds like you were looking at electric or electric assist bikes. By hybrid I meant a pedal bike that's a cross between a mountain and a road bike. Upright seating but with narrower tires than a mountain bike, so it's more efficient on paved or packed gravel surfaces. The one I have is a Diamond Back and cost about $350. 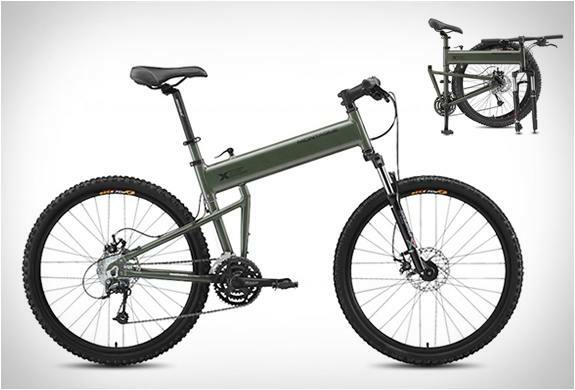 Three words: Folding mountain bike. 43 miles one way so I've thought about this before. Montague, new its very expensive [~$900], but keep an eye out on the sale aps and etc and you can find them for $150. There are other folding mountain bikes whose new price is in the <$250 range. 5) and of course: a freaking cat riding on your shoulder. I have a 16 mile commute to work with my brother (we live and work together). So if our vehicle was trashed it’d be a bit of a walk, he has health issues so we probably wouldn’t make good time. Fortunately we most likely wouldn’t have to, our bosses have regularly offered to let us employees borrow company vehicles. If we needed to head home we’d most likely grab our bags out of the wrecked car, a couple bottles of water from the fridge, and fire up one of the trucks. However most of the company employees would probably be helping out around town. It’s a small town without much infrastructure. Volunteer fire dept and no Leos other than one state hypo and a Sheriff’s deputy that live near by. Between the bucket truck, backhoes, winch trucks, and service trucks we’d be able to help out a fair bit if it’s a natural disaster. Plus the bosses keep the break room stocked with snacks and drinks plus first aid supplies, the service trucks have generators, and we have fuel on site. If it’s TEOTWAWKI then we arm ourselves, most of us carry or at least have one nearby, borrow a truck and head home. With the exception of my brother, I, and the bosses everyone lives within a mile of the shop so if necessary we could probably shelter in place for a bit with one of them. Your place of work sounds a lot like the place the main characters in 'Lights Out' worked. At least I got Déjà Vu about it when reading your post. Do they have a fuel dump there for the vehicles to fuel up? I am in Arizona so I dont really have to worry about tornados or earthquakes, but for the sake of the thread let's say Cali had a big one and fell into the ocean. That would probably be big enough to cause some issues here. I am a police officer so as much as I would like to head for my family I would just keep working. I would just have to trust in my fellow officers to see to my families safety. When I could I would make sure they were safe, but then I would just head back to work. Everyone has a bag packed so if we had to leave we could. I always had my ruck packed in the army, and when I got out I didn't see any reason to change it. I keep a med kit, a few cases of water and snacks in my patrol vehicle so those are covered. If it were a total loss, such as worldwide earthquakes I might think a little different.